The ceremony of Kirking the Deacons of the Incorporated Trades takes its origin from the fact that the Deacons were members of the Town Council from 1583 until that privilege was withdrawn in 1833, a period of 251 years. During that period the whole Council processed annually into St. Giles’, where a service of dedication and blessing was held, during which the councillors were reminded of their duties and responsibilities and were charged with the responsibility of doing their civic duty impartially and to the best of their ability. After 1833 there seems to have been a gap when most of the Deacons were not kirked, but gradually the custom was revived in a number of incorporations. 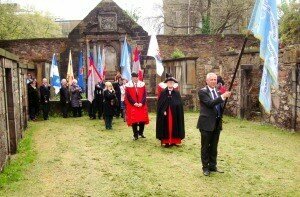 At the present time, a service is held annually at or around Beltane (first Saturday of May, being the traditional time for electing the deacons until the Act of Sett in 1583) usually in the Greyfriars’ Church, which the Deacon-Convener and all the Deacons are expected to attend with their chains of office and their banner-bearers. The service is attended by the Lord Provost and some of the Council and is conducted by the Convenery’s Chaplain, who chooses suitable readings and leads the prayers, Appropriate psalms and hymns are sung and then there is a procession from the church to the grave of Mary Erskine, with whom the Incorporated Trades founded the Trades Maiden Hospital 1704. 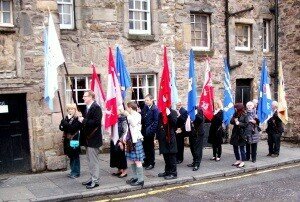 The proceedings usually finish with an extended informal lunch in a nearby establishment just off Candlemaker Row. This year the Kirking of the Deacon will take place on Saturday 30th April 2016.